Test Data: BF- .88 LE- 7.6 WPDA- 1.62 at 300 lbs. If you understand structure, this guy should turn your crank. If you truly want to make Berkshires that are as sound as you can make them off their hip and hind leg, you need to study one here. Kahuna is tall fronted with a long neck and is big legged, big ribbed and has excellent feet and toe quality. We love this guys hip and hind leg as he has the ability to get his back legs way behind his tail and still keep his back foot squarely planted on the ground. Kahuna is opened up in the lower half of his body and he is packed full of muscle. 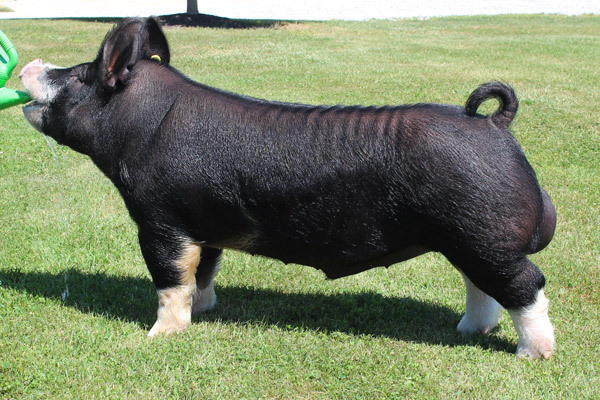 Excellent Berkshire Boar sire that can take Berkshires to a new level. Tremendous Frame Size, Taller Fronted, Rib Shape, Long Necked, Big Legs and Heavy Structured with Muscle.